It's often said that good things come to those who wait — but a bloated $4.5 trillion balance sheet might be a notable exception to that rule. With the Federal Reserve facing a Herculean conundrum in unwinding its crisis-era monetary policy — and a likely leadership transition on the horizon — Goldman Sachs (GS) suggested on Saturday the central bank could move early to reduce the vast sums of government and mortgage-backed securities (MBS) it holds on its books. In a research note to clients, the bank pointed to the likelihood that President Donald Trump may "reshape the leadership" of the Federal Open Market Committee (FOMC), the Fed's powerful policy-making body, as the terms of Fed Chair Janet Yellen and Vice Chair Stanley Fischer expire in early 2018. "This could be important for balance sheet policy because many Republican-leaning economists have criticized quantitative easing (QE) and have expressed a preference for rapid balance sheet rundown, perhaps even through asset sales," wrote Daan Struyven, a Goldman economist. If the new appointments—especially the new chair—are thought to favor aggressive balance sheet normalization, perhaps even including asset sales, and if all decisions are left up to the incoming team, financial markets might experience heightened uncertainty during the transition." Goldman suggested there was a "strong 'risk management' case for an announcement of very gradual balance sheet runoff later this year," because of the political risk associated with new leadership at the Fed. "Our forecast is that the discussion around reinvestment continues for most of this year and the plan is formally announced in December 2017," Struyven said. 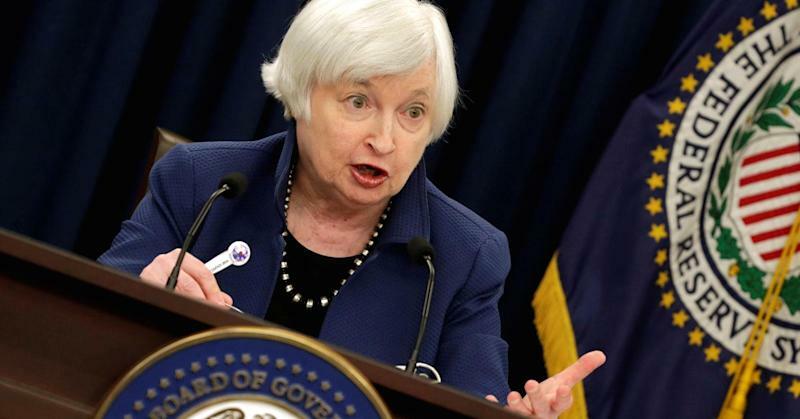 "At that meeting, we expect the committee to hold the funds rate steady after hiking in both June and September. We expect the quarterly hikes to resume in March 2018." The economist harked back to 2013's "taper tantrum," in which markets reacted the Fed's suggestions of tighter monetary policy by sending bond yields surging and stocks reeling — albeit temporarily. A potential fire sale of Treasurys and mortgage-backed securities by the Fed "could have significantly more adverse effects on financial conditions than gradual runoff, and the mere risk of such an outcome might set up another 'taper tantrum,' " Struyven added. As the central bank begins a campaign to tighten benchmark interest rates — making a quarter-point hike just last week — it's renewed a debate over how to unwind the Fed's massive bond buying program. Some market observers have long argued that the Fed has distorted financial conditions with QE, and the central bank faces a huge task trying to pare down its bloated balance sheet. "The bigger the Fed's credit footprint, the more it interferes with the efficient employment and pricing of credit," wrote George Selgin, a senior fellow and director of the Center for Monetary and Financial Alternatives at the libertarian-leaning Cato Institute, in a blog post last month. "By directing a large share of savings to purchases of longer-term MBS and Treasury securities, for example, the Fed has artificially raised both the prices of those securities, and the importance of the housing market and the federal government relative to the rest of the U.S. economy," Selgin wrote. "It has also dramatically increased its portfolio's duration gap and, by so doing, the risk that it will suffer losses should it sell assets before they mature." On Friday, Minneapolis Federal Reserve Bank President Neel Kashkari, the lone dissenter against the U.S. central bank's decision last week to raise interest rates, the U.S. economy is still falling short on employment and inflation. Kashkari, an alumnus of both Goldman Sachs and the U.S. Treasury who oversaw the government's Temporary Asset Relief Program (TARP) during the financial crisis, believes the Fed should wait on raising interest rates until it publishes a detailed plan for how and when it will reduce its $4.5 trillion balance sheet. Goldman set forth two scenarios under which the Fed could begin trimming its balance sheet. Under an "early start, passive runoff" scenario, the bank said the Fed "gradually tapers reinvestment in December 2017 over 10 months but does not sell assets." Conversely, under a "late start, active sales" scenario, Goldman said the Fed could cease reinvesting in bonds in July 2018 "without tapering and actively sells $40bn of assets per month." Under the latter, the Fed could shrink its balance sheet by about $250 billion per quarter starting in the second half of next year, "with similar contributions from maturing assets and active sales," the bank added. However, neither scenario is without its risks, Goldman's economist wrote: "While our baseline estimate suggests relatively little tightening from balance sheet rundown, the uncertainty is substantial. The 2013 'taper tantrum' also provides a reminder that the impact of balance sheet policy on financial conditions is uncertain and could be larger than our baseline estimate."